Well, we did it — the pattern part of the afghan is complete. This section is another 5 rows of plain Tunisian Knit. It shouldn’t take too long, now that the Deathflake pattern section is complete. if its a knot that i cant undo then id scream, i hate it when it happen especially when only have few row left. I did get it undone but I’ve been pushing it, trying to get this section completed and it went down to 4 stitches left and had to pause. and.. taking a look at the yarn remaining, now I’m worried that I won’t have enough to finish. I’d really hate to get REALLY close and have to wait til I got to the store to buy more — and then have to buy giant balls of yarn just to get a few yards. 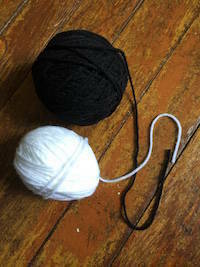 and.. taking a look at the yarn remaining, now I’m worried that I won’t have enough to finish. I’d really hate to get REALLY close and have to wait til I got to the store to buy more — and then have to buy giant balls of yarn just to get a few yards.So, I think I’m going to cut the 5 rows down to 3, for this afghan (5 would be nicer) and move on to the anti-curl section. when i buy yarns i always buy an extra yarn just in case, if i have the money if not then i would start it and go back when i have more money but i do hate it when i run out of yarn and i would have to leave it till i get more and finding something else to do while waiting. I was using yarn that I had purchased a year ago or, yes, I would have purchased extra, just in case!!! I finished the afghan today… WOO HOO. I might have had enough to finish the other two rows but I’m glad I didn’t chance it. It looks great and I didn’t have to panic.